IoT technology’s potential is expanding rapidly, with 66% of US cities investing in Smart City innovations (according to a survey by the NLC) and a growing number of private households integrating IoT. This explosion of activity in IoT markets doesn’t look to be ending anytime soon. 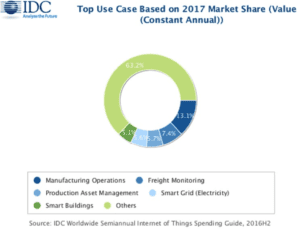 The IDC is predicting $1.2 trillion dollars in spending dedicated towards IoT by 2022. These innovative and life-changing products will soon be commonplace, filling many unforeseen gaps in technology that can make our lives easier. As the IoT platform expands and takes root in our cities and households, it raises an important concern: security. “Security concerns are holding back wider adoption of smart devices. Only if we can improve confidence in IoT security can we realise the potential of smart technology.” – Bill Buchanan, Edinburgh Napier University Professor. Edinburgh Napier University is working alongside Keysight Technologies to provide IoT platforms with the security necessary to keep the expansion’s momentum moving forward. Without proper security measures, IoT technology cannot operate successfully and could leak valuable information to malicious hands. Security will be one of the top issues regarding IoT moving forward, but there are some firms, such as Fybr, that are already taking the extra steps to ensure security with their technology. Fybr uses cutting-edge security measures such as end-to-end encryption, unique device keys, and time-limited session keys, all with NIST-approved algorithms. This security platform is designed to keep data safe and is one of many unique offerings Fybr has. To find out more about Fybr’s security and our other innovative practices, visit Fybr’s Website.